It’s July. The weather’s a bit rough and the days are short.Riding your bike is to looking less attractive than snuggling under the doona or eating bacon sandwiches. Winter’s made even worse for we antipodeans because it falls in the middle of the year: Traffic jams, annoying colleagues, and long days stuck in front of a computer all seem worse when you’ve got a slight cold and you know you’re only. Half. Way. There. But wait! I hear you say. 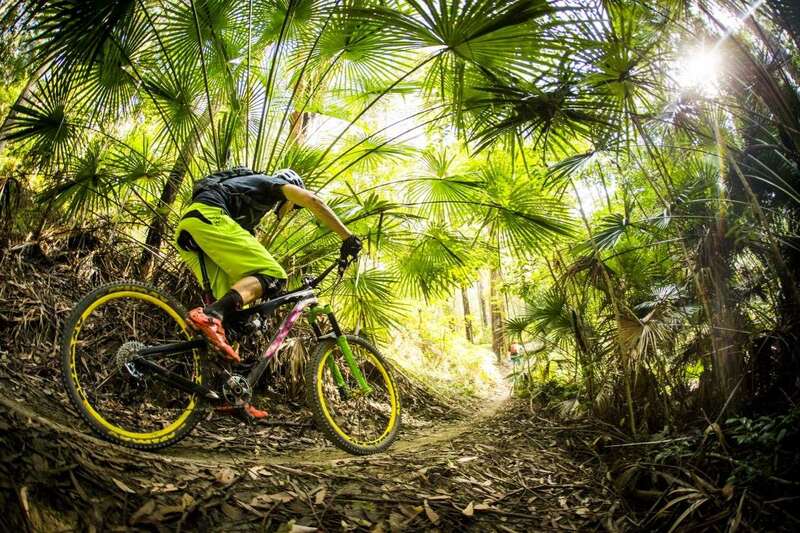 Nearly all the MTB destinations are in cold places, like the mountains or New Zealand… that’s not going to help. And what about your partner or even the kids – how on earth are you going to get THIS leave pass approved? Noosa is the answer. 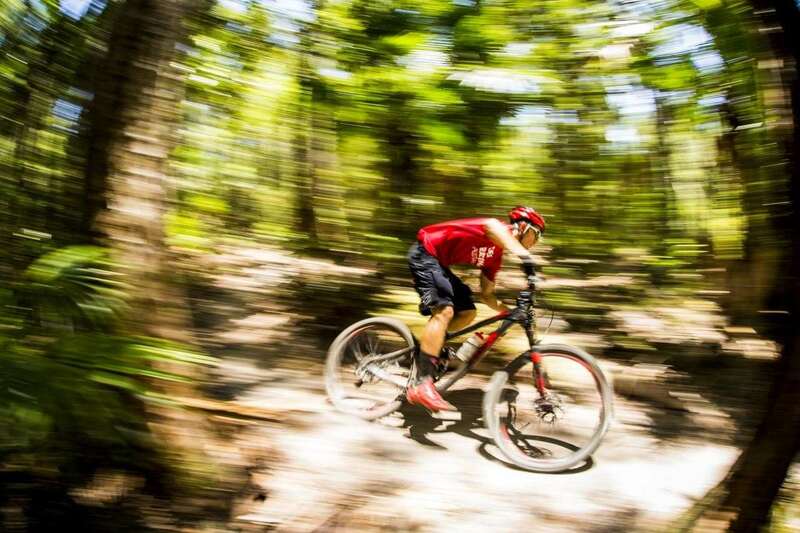 While it’s not known as a mountain bike destination yet, thanks to some dedicated locals it’s fast carving out a great reputation that’s only set to grow. 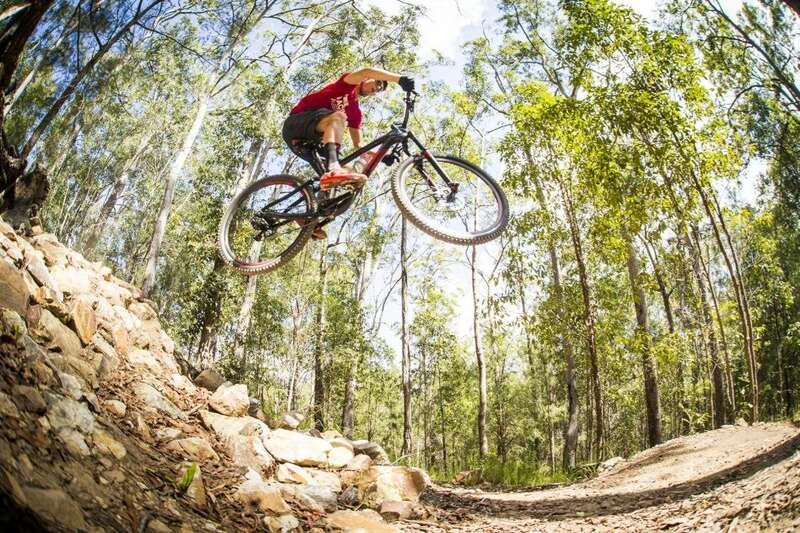 Home to elite riders like Andy Fellows and Ethan Kelly, Noosa has it all: gravity, jumps, hills, and amazing trails. 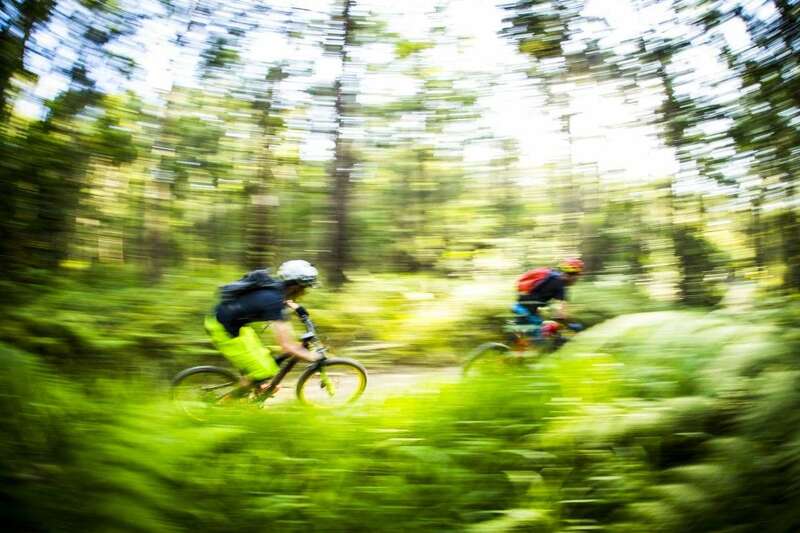 There’s more than enough riding within ten minutes of this holiday town to keep you occupied between riverside barbeque sessions and lolling about on pristine beaches. Noosa is easy to reach by air with Qantas and Virgin flying regularly to Sunshine Coast airport from major cities and hiring a car from there. Of course it’s also possible to reach Noosa from Australia’s east coast cities by car – it’s obviously a short enough drive from Brisbane, but if you’re brave you can also take a couple of days to motor up the coast from Sydney, Canberra, or even Melbourne, maybe stopping a few times to check out trails you’d never otherwise get a chance to experience. A fabulous idea that AMB covered in Richie Tyler’s The Great East Coast Road Trip. By geography alone, Noosa was always destined to grow up and become a holiday town. First there’s the climate: with an average annual temperature of 25 degrees (usually sitting between 20 and 25 in winter) and warm ocean currents barely ever dropping water temperatures below 20 degrees, Noosa is alive at any time of the year with locals, travellers, holiday-makers, and tourists from every walk of life. Then there’s the beaches, where soft, talcum powder sand invites you to wander down and dip a toe into pure, azure waters. Further afield, the National Parks that surround Noosa, from its dramatic hinterland – which boast natural lakes, rainforest, rivers – to of course the pristine coastline, earned Queensland its first UNESCO Biosphere Reserve status. An edge of ritzy glamour sets Noosa apart from its Aussie beachside cousins – there are fewer backpackers than you’ll see in Cairns, and nowhere near as many hippies as you’d find in Byron. The ambiance is less boisterous than the Gold Coast, but livelier than NSW’s south coast. 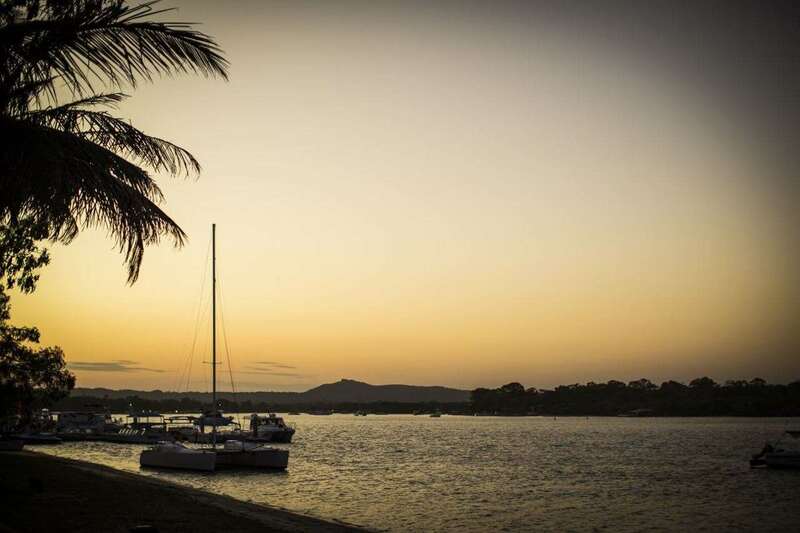 Overall, Noosa’s vibe is classy, effortlessly cool, and just a little bit posh – it’s easy to pick a local – they’re the perfectly tanned, perfectly fit individuals doing yoga on the river or towelling off by the surf club before you’ve even stumbled out of bed. That said, visiting families dominate this beachside town: chosen by generation upon generation of holiday-maker for its safety, variety, peace, and natural attractions. The overall effect is a jumble of subtropical gardens, barefoot kids, ice cream parlours, and lots and lots of kaftans. The area’s sophistication capital is Hastings Street at Noosa Heads, a strip of cafés, bars, and stores selling scarves and scented homewares opposite the long crescent of Noosa’s Main Beach. It’s the perfect place to sit and work on your people watching skills over a $5 coffee. But there’s plenty to do away from the oversized sunglasses and designer dogs of Hastings Street. 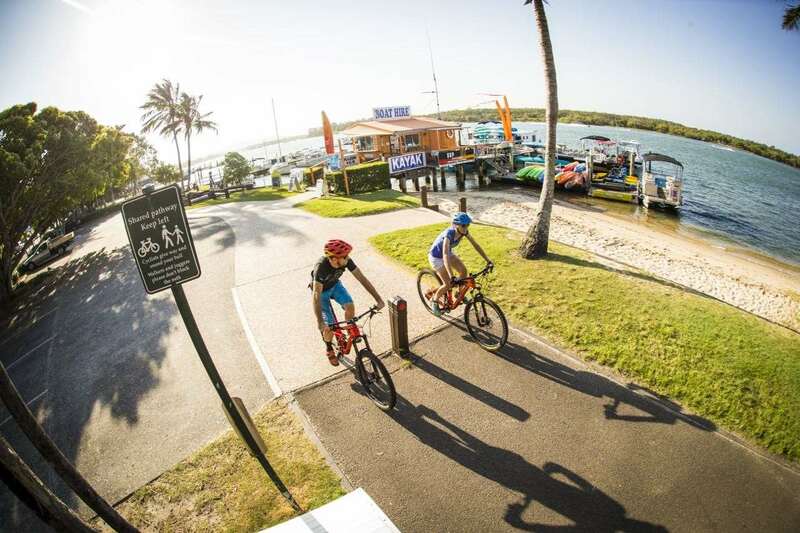 The first thing to remember is that it’s no accident that Noosa is the home of the largest Olympic distance triathlon in the world – running, swimming, and of course cycling – are integral to the Noosa lifestyle. 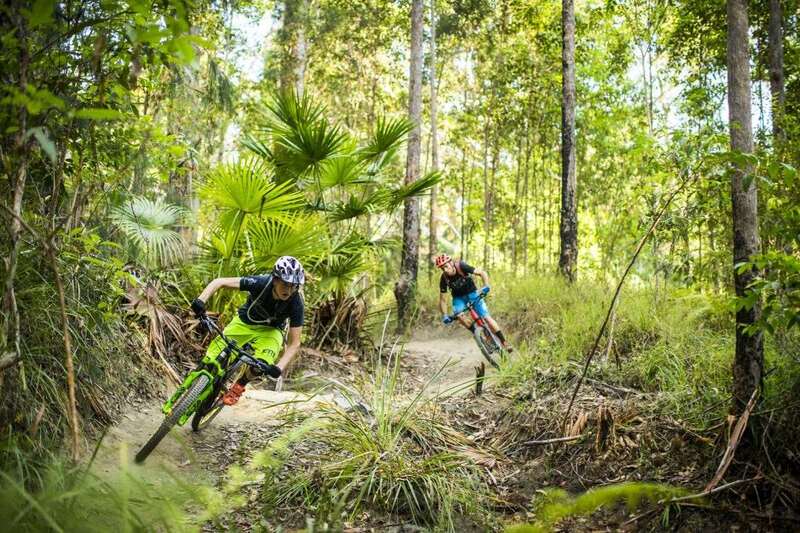 Local mountain bikers have long enjoyed riding out into the forests just outside Noosa in the lush and gorgeous Sunshine Coast Hinterland around Cooroy, Pomona, and Tewantin. 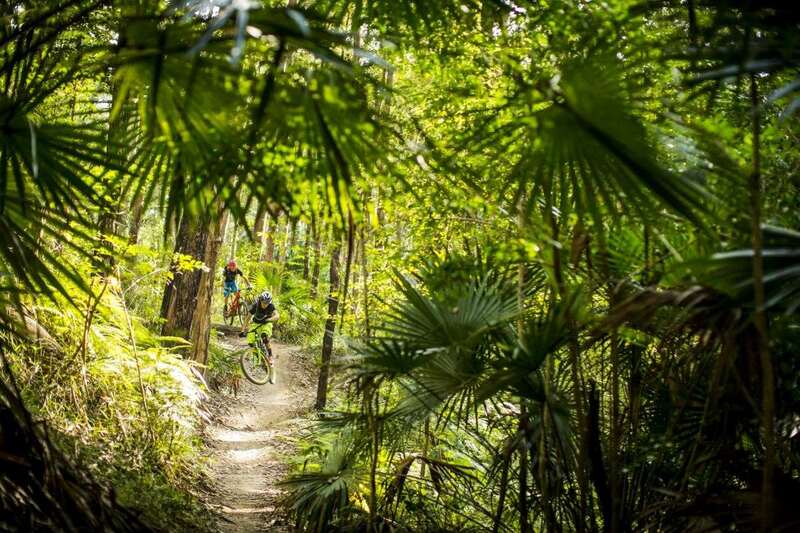 These days, Tewantin National Park is prized for its Wooroi trails, just a 10-minute drive from Noosa. We arrive mid-morning on a weekday, but the small carpark is overflowing with a bunch of other cars with bike racks and a group of lucky 14-year-olds heading out for school sport. Damian McGarry is our guide for the morning. 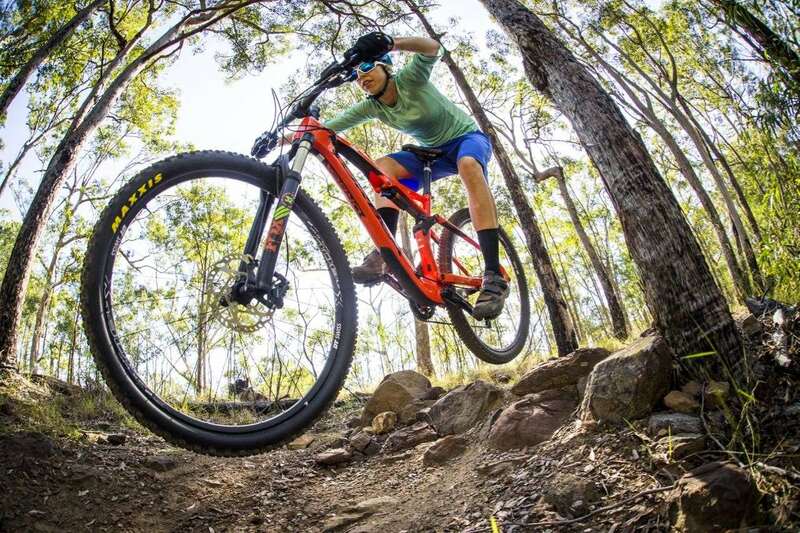 Vice President of local mountain bike club Noosa Trailblazers, Damian explains that Wooroi has been developed through a series of government grants and a lot of hard graft and advocacy from the mountain bike community. 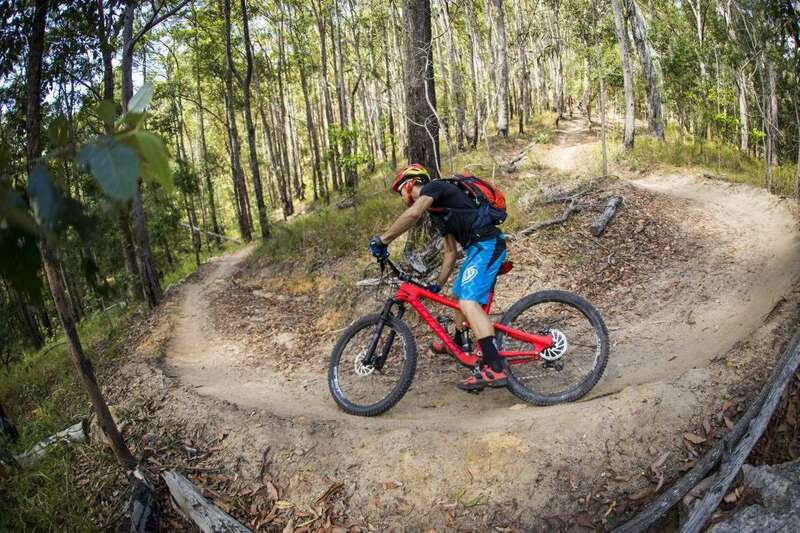 Rocky, scratchy trails have gradually been replaced with fast-flowing berms and jumps, as well as plenty of easier singletrack for beginners or a quiet afternoon cruise. 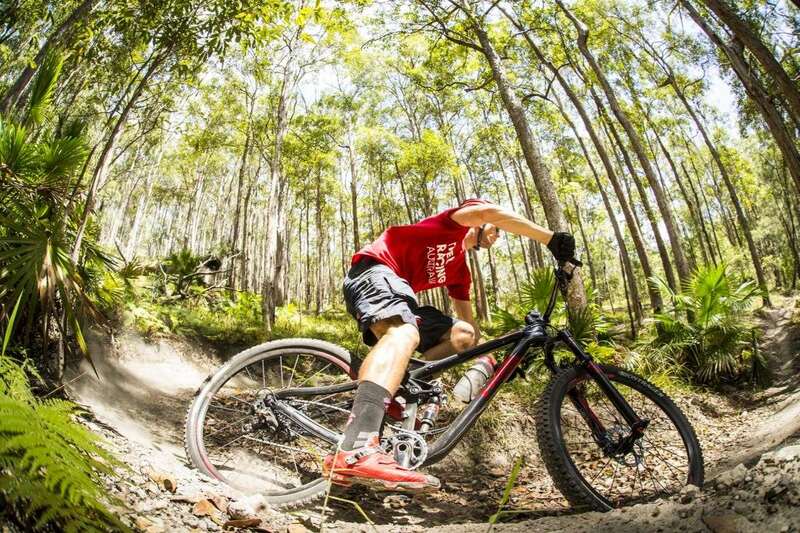 Most of the trails have been designed and constructed by Pete Wilson of Trailworx and they showcase his fast flowing, something-for-everyone style. Wooroi is intelligently designed so that the easiest trails are the most accessible (makes sense if you’re a beginner or with kids who don’t have the legs to go long distances into the bush) and we first head into wide, easy trails under a canopy of enchanted rainforest: tall timber, cabbage tree palms, gargantuan stumps, and wooden bridges over mossy creek beds. As we gradually climb away from the carpark, the trails become more challenging, too, with tighter, bermed corners weaving through the forest. Before too long we emerge on a ridge, suddenly in open eucalypt woodland, where we climb some more on fire road, then link up with a very handy access road named Gyndier Drive. A massive gift to Wooroi’s gravity-loving riders, this smooth bitumen climb is closed to cars, and the gradient’s easy enough for us to chat as we spin along in spite of our trail bikes, banking enough elevation to keep us happy for the rest of the morning. There’s a nifty trail entry just off to the left at the top of the climb which takes us up just a little higher (the gradient’s a little less gentle here) until we’re in open woodland surrounded by clumps of sword grass and deafening cicadas. 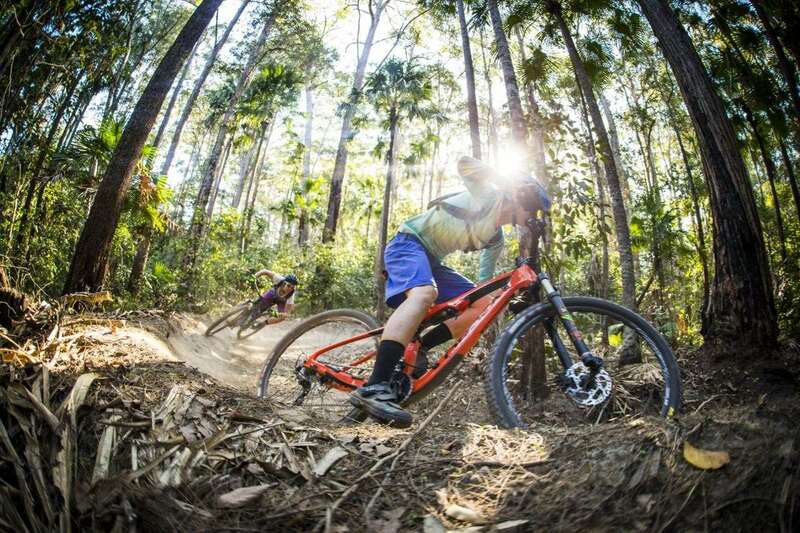 Here we begin the descent via ‘Snake’ that will take us on to ‘Bloodwood’, a combination of Wooroi’s iconic trails – a breath-taking run of jumps and swooping berms that follows the contours of the hill all the way back down into rainforest. We link up with ‘Glider’ to take us all the way back to the carpark. It’s well past lunch time by then – we’ve stopped for a lot for photos and to try different lines – but after an afternoon on the beach, a solid night’s sleep, and a morning coffee on Thomas Street in Noosaville the next day, we’re ready to return to Wooroi for second helpings. We head out in search of local favourite ‘Milkmaid’, go for a high-speed run down ‘Froglet’, and explore plenty more besides. 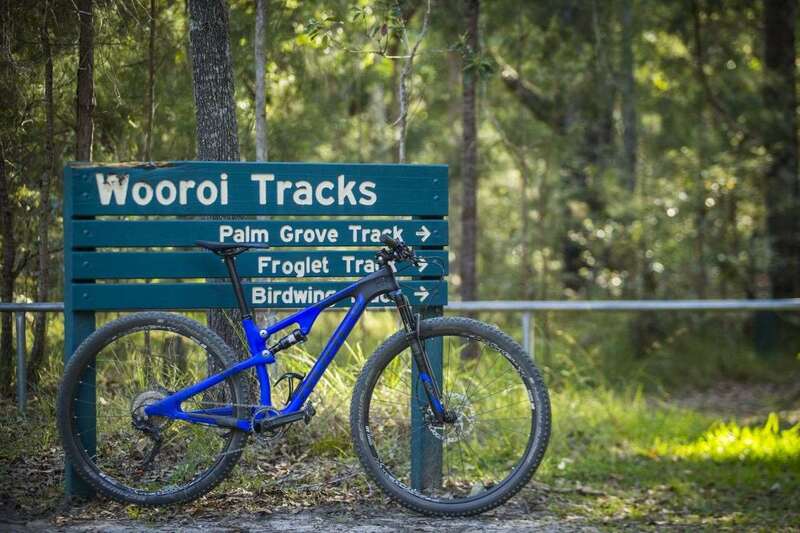 Wooroi has singletrack loops for different levels of rider –even for families and kids on their first bikes. There are jumps big enough to give advanced riders a buzz, but almost everything is rollable or accompanied by an easy b-line. Wooroi’s signposts have just been installed, so it’s pretty easy to find your way around and explore the 30-odd kilometres of trail, which are so well patronised by the local MTB community from the Noosa Trailblazers club that it’s more than likely you’ll run into someone you can ask for directions if you need a trail tip. The trail entrance is just off the car park off Cooroy Noosa Road. There are no toilets so be sure to go prepared. 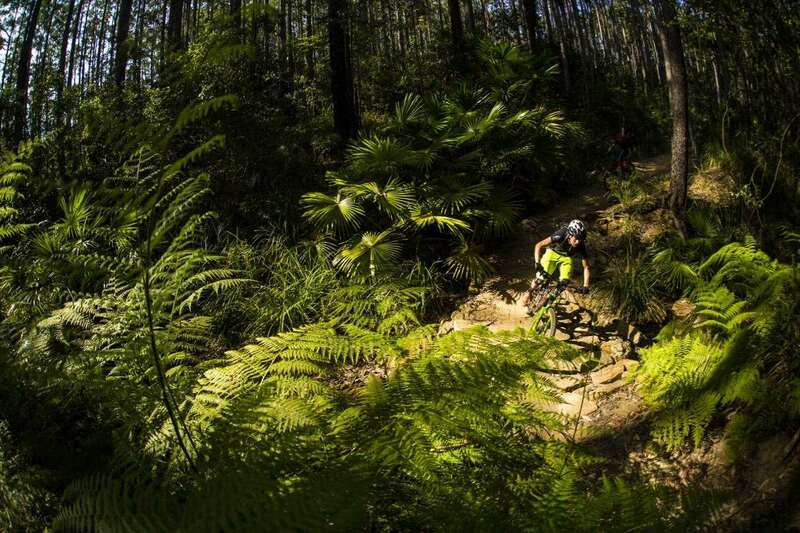 A bit further down south, Parklands started out as a disused pocket of land frequented by four-wheel drivers and moto riders, on whose tracks mountain bikers gradually moved in and found a home. 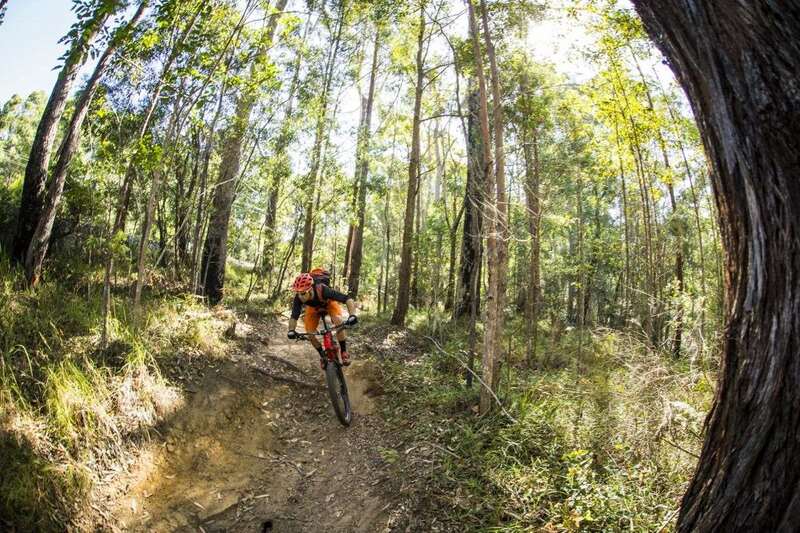 Today, Parklands is extremely popular with the local scene and is largely managed by the Bushrangers MTB club. 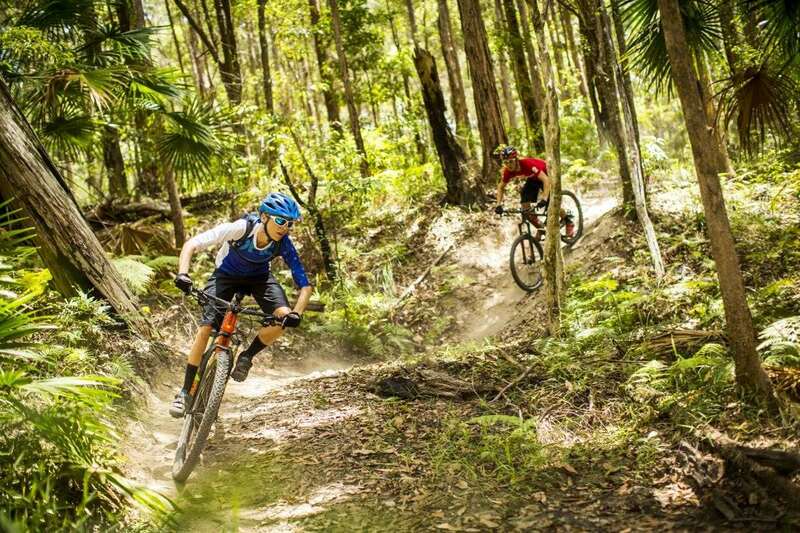 Parklands boasts natural, hand-built trail at its best, with narrow singletrack snaking through lush subtropical rainforest and bushland. 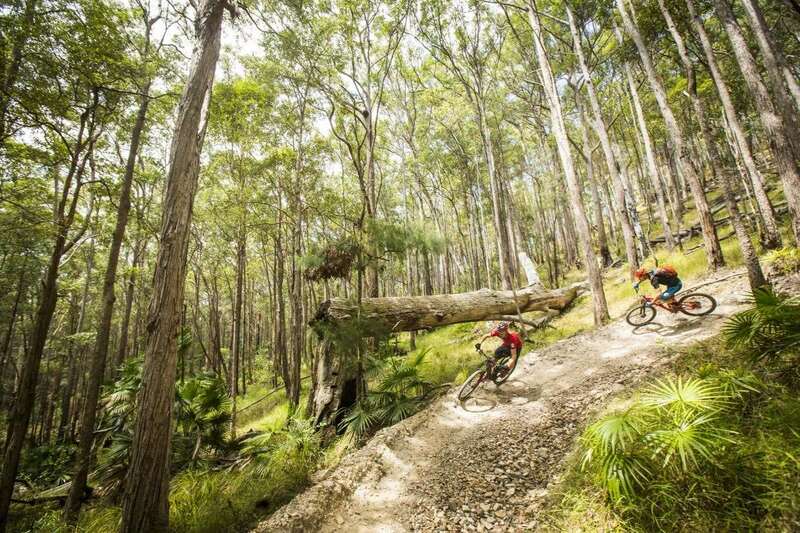 Look out for log rolls, jumps, and the odd bit of North Shore, and watch your bars when the trail gets tight. There are a couple of entrances to the trails, one off Atkinson Road West, and another off the Bruce Highway. Check with Bushrangers for more information, and wherever you are, please avoid riding trails in the wet. 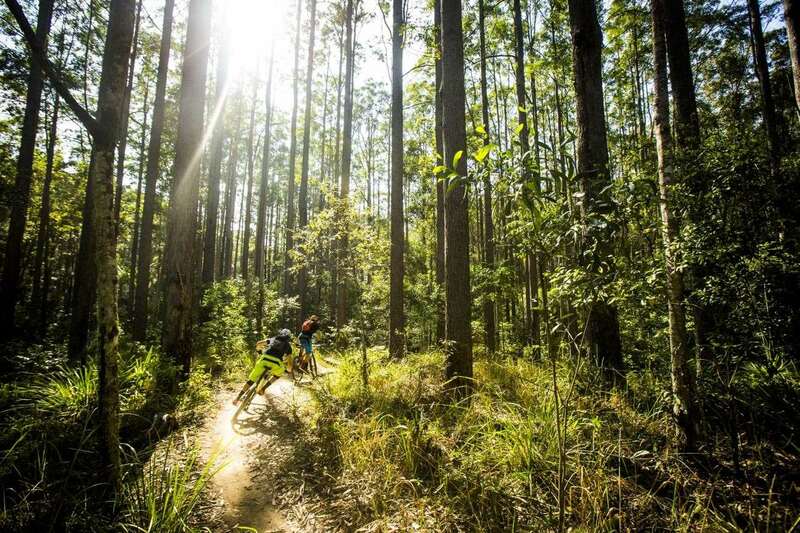 Further afield, there’s endless kilometres of forest trails meandering through the hills of the Sunshine Coast Hinterland and linking the townships of Pomona, Cooroy, Cooran and Kin Kin. 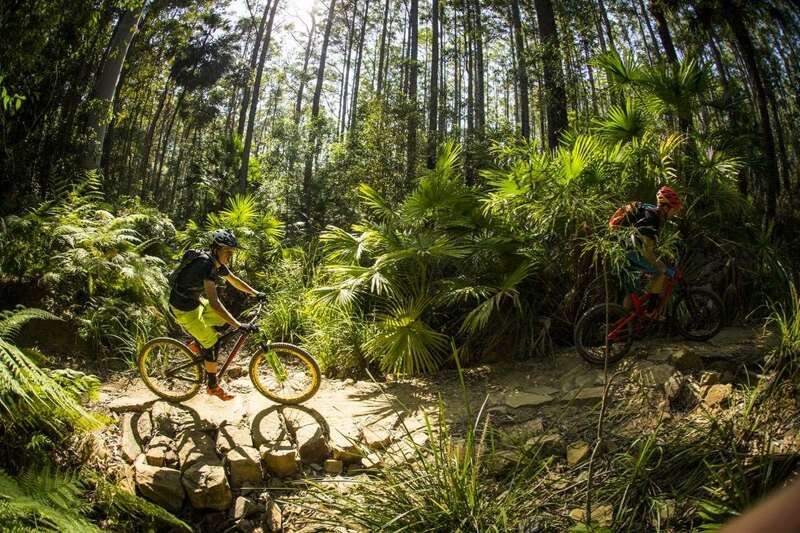 The Noosa Trail Network is for bushwalkers, horse riders, and mountain bikers and is looked after by the local Noosa Council. Maps and information are available on Council’s website, and the routes are typically well-signposted. Be sure to take the usual precautions whenever you head out for a ride. Needless to say, with its focus on the good life, food is taken very seriously in Noosa. 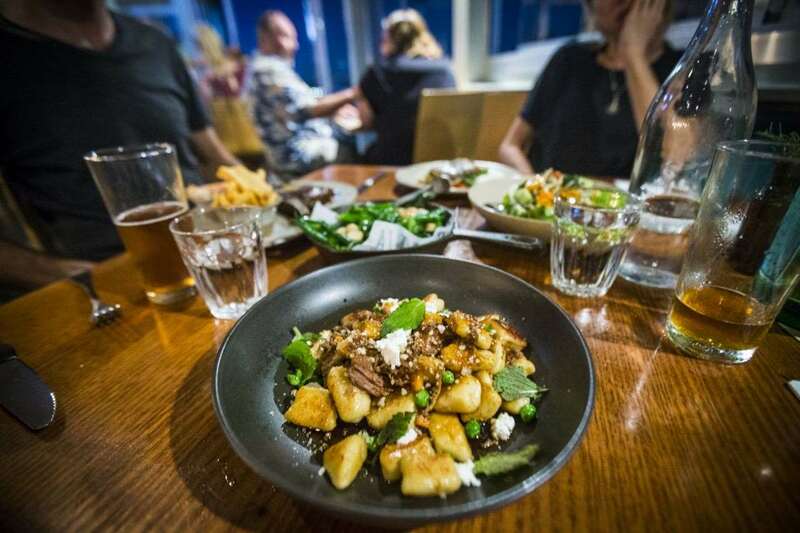 There are countless restaurants and cafés to choose from near Hastings Street and in Noosaville’s Thomas Street, as well as charming coffee shops and eateries in the hinterland towns. With fresh seafood readily available and weekly farmers’ markets, picnics and barbeques are also great options, especially if you are quick enough to grab a picnic table opposite Gympie Terrace on the Noosa River – a peaceful strip of bike path, jetties, restaurants and parks and the perfect place to watch the sun go down. 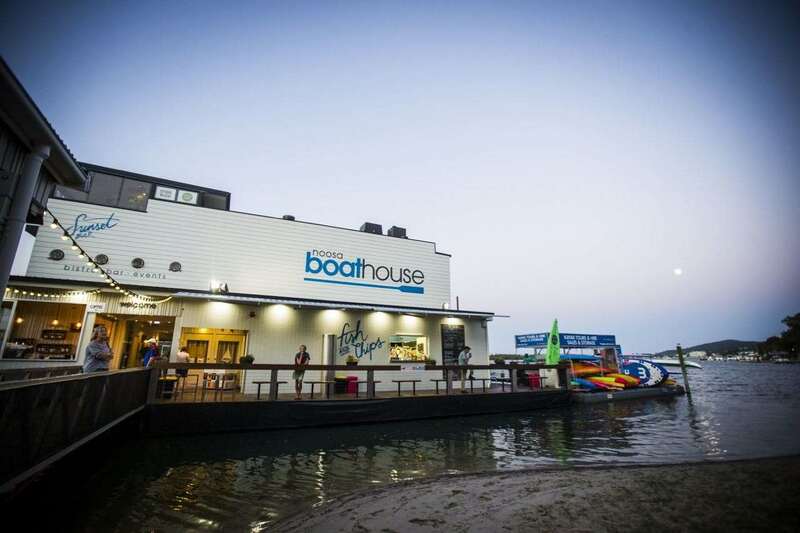 If you like the spot but prefer a roof over your head, The Noosa Boathouse is a local institution. Perched on top of the river, AMB staff were pretty impressed to see fish swimming beneath us as we ate, and once the sun had gone, the moonlight on the river was spectacular. 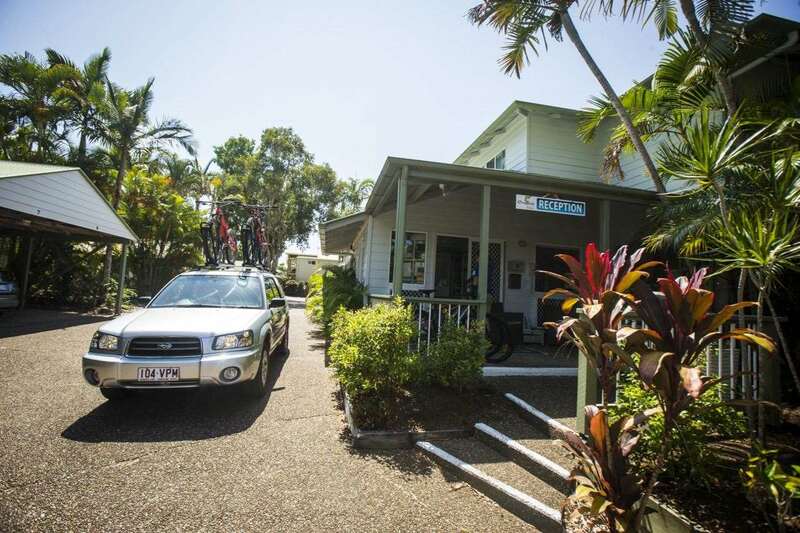 Noosa is a holiday town, so there’s a place to stay to suit every budget – from beachside penthouses to caravan parks and camping. 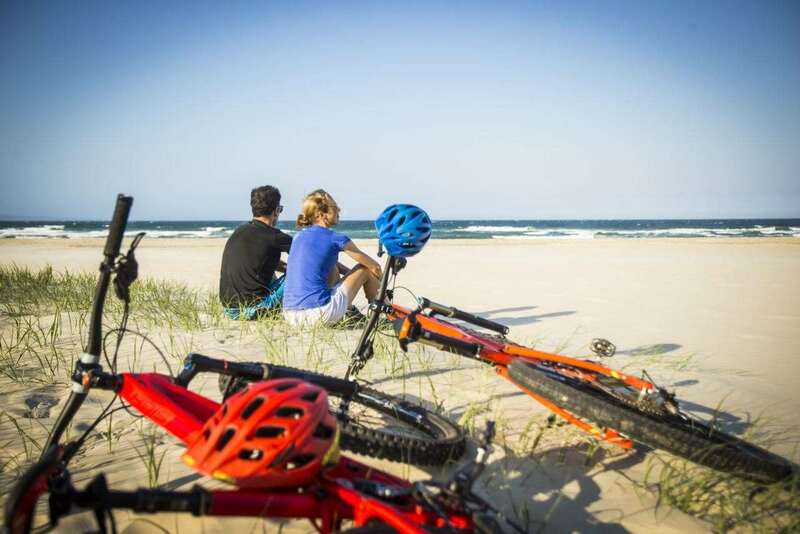 If you’ve got bikes and a family, try Coral Beach Resort in Noosaville. It has three lagoon-style pools (one of which is heated – great for winter), poolside BBQ areas, two saunas, a tennis court, Wifi (limited), and bike hire. Best of all, they’re keen to have cyclists come and stay and explore the region. It’s a bit removed from the bustle of Hastings Street and the beach, but close to riverside cycle paths and parks, as well as Thomas Street’s eateries. 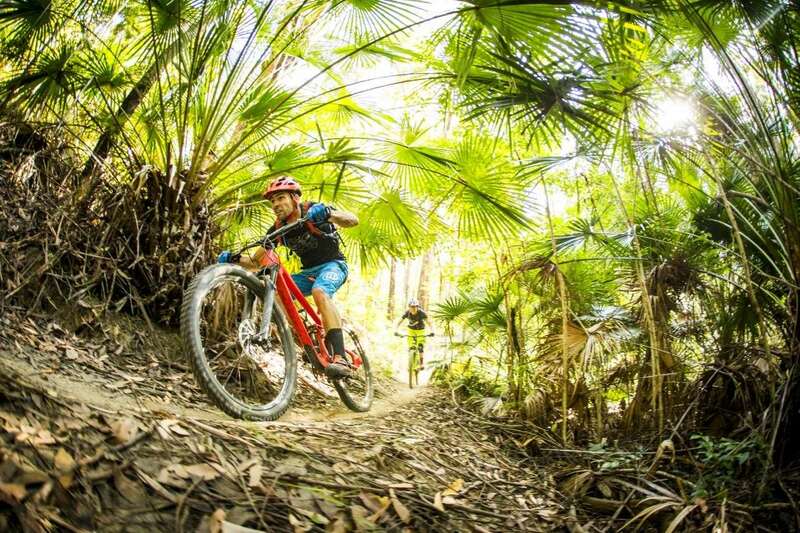 Here at AMB we take our job of advocating for mountain biking in all its forms very seriously, but even we have to admit that you’d be crazy to visit Noosa and do nothing else. Noosa is a holiday town at heart – you can sense it in the salt air, which smells faintly of fish and chips, and in the subtropical warmth that nestles on your shoulders like a cloak of Valium the moment you arrive. While the beach speaks for itself, on the river you can try kayaking, fishing, or stand-up paddleboarding, and the area has a few golf courses to choose from too, if you’re that way inclined. 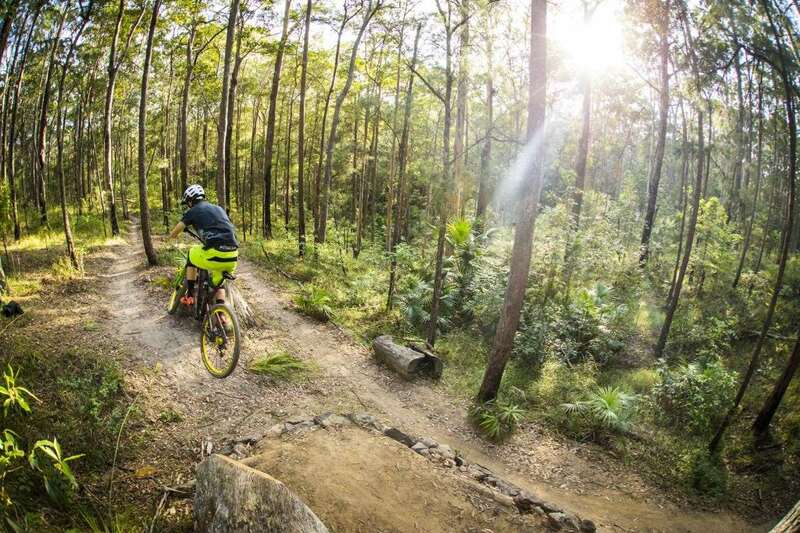 Don’t miss this chance to drive out to Noosa’s gorgeous hinterland towns: Eumundi, Cooroy, and Pomona – Eumundi is particularly lively on Wednesdays and Sundays when the markets are in town. 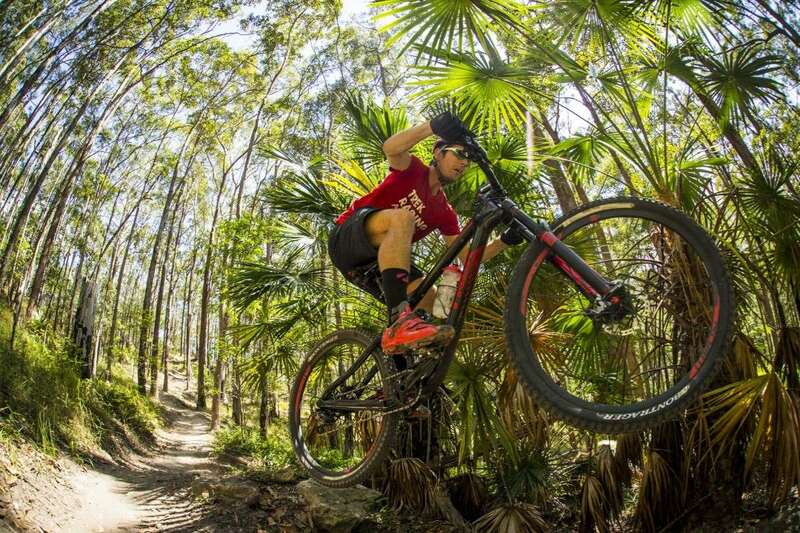 Noosa’s trail network is growing as fast as its reputation and with great food, subtropical warmth, tonnes for everyone to do off the bike, and incredible trails, there’s no reason to wait for Christmas to roll around before you take your next beach holiday. The days might be closing in, but there is a way out – and it’s on two wheels. The folks at Venture Cycles played a big role in supporting trail development and can help with bike servicing and even some ride tips. Cognition Bikes have also been involved and are located close to the trails if you’ve forgotten something or need some emergency supplies. Trail maps are also typically available through these stores. Bike On are a local business offering guided tours and some ride suggestions on their website. 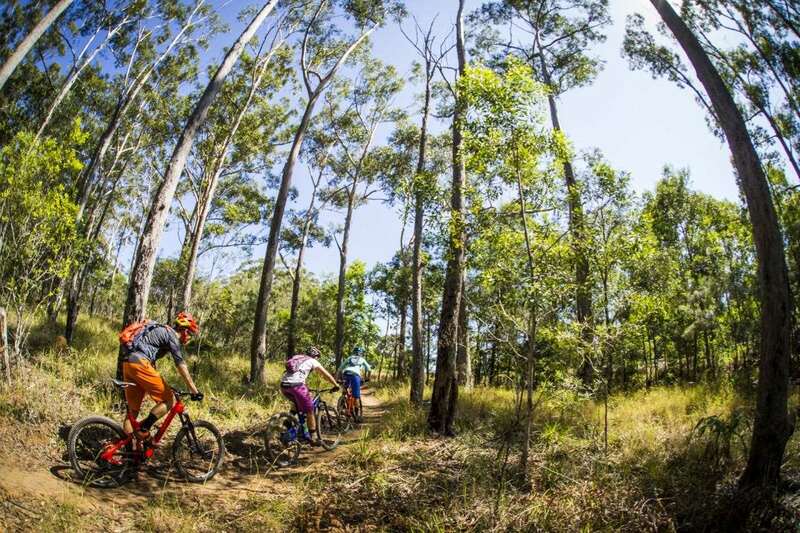 Noosa Trailblazers have been instrumental in securing funding and organising trail work at Wooroi, and are often out riding the trails they love. They’re a family-friendly club and keep a regular calendar of rides.